This is the second in a series of answer posts to reader-submitted questions. 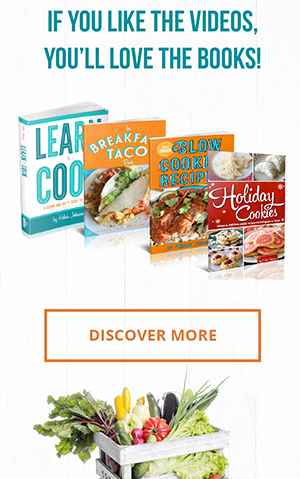 Some of these posts may be incorporated into the revised edition of the Learn to Cook book. Okay! Great questions! We got this, team! Easy sauces, coming right up. But first. Let’s dish. Sauces serve many purposes. They might add a complementary flavor or texture to the main dish to balance it out. Think about the classic pairing of a fat, succulent bratwurst with a sharp mustard that cuts the richness, or the opposite idea: tender asparagus with a tart, eggy Hollandaise to add richness. Texturally, you might consider the combination of a sweet, sticky fruit chutney alongside salty, charred meats or a slick garlic aioli on a crunchy crostini. Sauces might also enhance a dish by matching its flavor, rather than contrasting. This is a little trickier to do; it works best when the main dish is mildly seasoned — think of baked chicken and chicken gravy, or broiled white fish with anchovy butter melted over top. 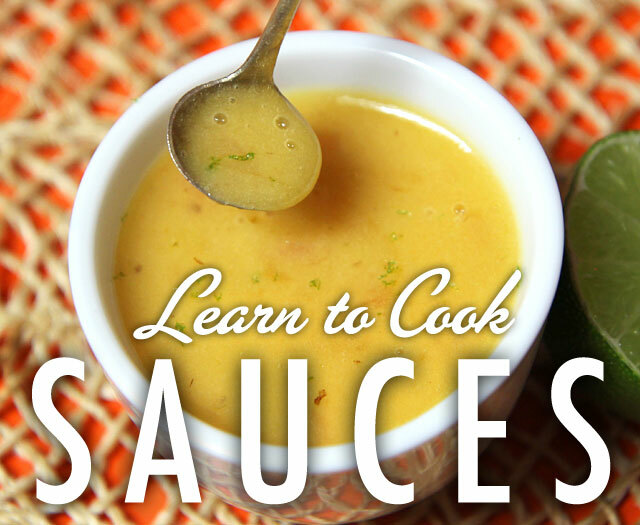 Sauces are also a lifesaver to overcooked meats. A dry chicken breast or fish fillet becomes edible again with a pat of compound butter melted on top, or covered in a cream sauce. 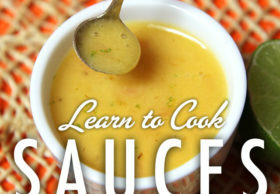 That’s not to say we should aim for overcooked as an excuse to make a buttery sauce, but it’s a good trick to remember. And of course, sauces also add visual appeal, as in bright red raspberry sauce on chocolate cake. To close: Sauces make things fancier than they were before. Learn to use them to your advantage. 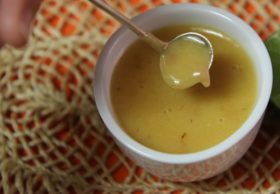 I’ll start with an uncooked, super easy sauce that goes great over grilled, roasted, or baked meats and seafood and also goes well with boiled or roasted potatoes, steamed green beans and summer squash, and fresh sliced tomatoes. And, omigaw, it’s stupendous on a simple cheese omelet. 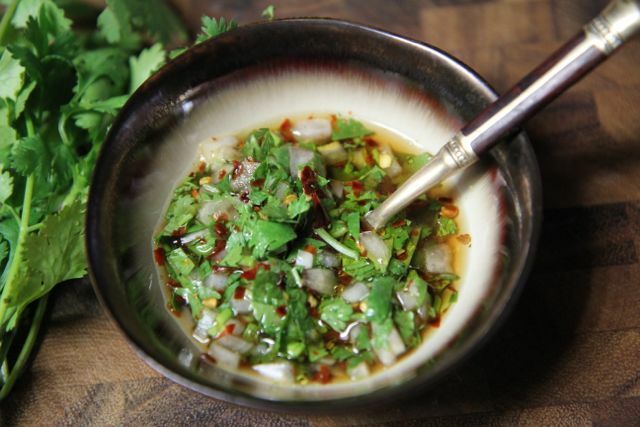 It’s a spicy Argentinian sauce called Chimichurri and there are endless variations. Combine all ingredients and let stand at room temperature for at least 10 minutes and up to 2 hours before serving. This will keep refrigerated up to 48 hours. Makes about 3/4 cup of sauce. 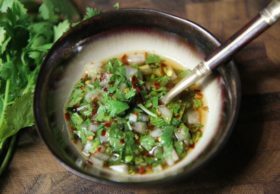 If you vary the basic recipe far enough, you’ll come to the land of persillade and gremolata, which are chopped herb condiments of the French and Italian persuasions, respectively. Combine all ingredients and serve right away. Make about 3/4 cup persillade. 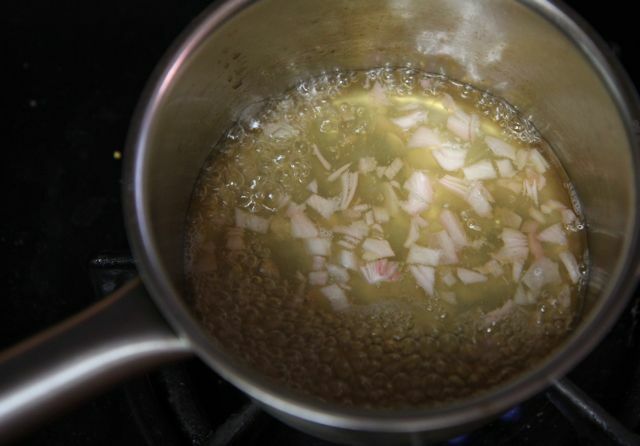 For a top-notch white wine sauce, make a Beurre Blanc (“white butter“), an easy French sauce that uses the proteins and lecithin in butter to hold the elements together in a smooth, rich, buttery sauce for use over seafood or chicken. It’s a great sauce to add a little fat and flavor to lean meats. At the Palace Cafe in New Orleans, I had blackened catfish topped with a Crystal beurre blanc and it was heavenly. Some beurre blanc recipes (like the Palace Cafe’s) use heavy cream in addition to the butter to help stabilize the sauce, but the original recipe didn’t use it and I find it rich enough without. If you want to try it with cream for a special occasion, add 2 tablespoons heavy cream to the wine mixture after it’s reduced, reheat to a simmer, then whisk in the butter as directed. You can also add any fresh herbs you like, thyme, tarragon, and basil are particularly nice. This is actually beer and lime juice, not white wine and lemon juice. I call it “beer blanc” and it’s lovely. Heat the wine, shallot, garlic in a small pot over low heat. Add the cold butter two pieces at a time, stirring with a whisk until almost melted before adding another two bits. Continue adding the butter, two pieces at a time, until there are only two pieces left. 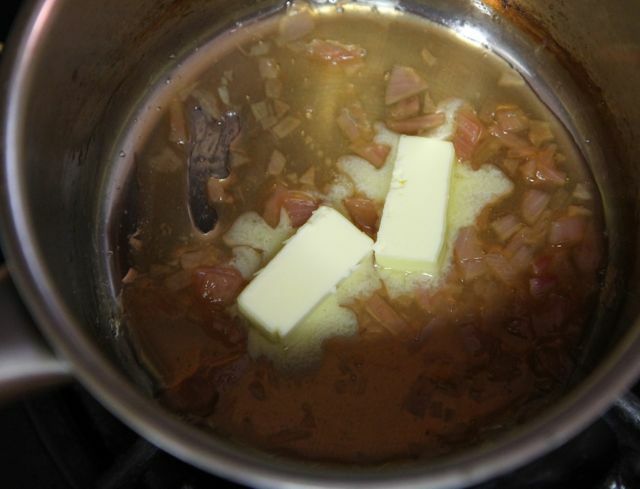 The finished sauce should be uniformly glossy and about the consistency of bottled Catalina dressing or heavy cream, but the more butter you add, the thicker it will be. For a more wine-tasting sauce, use the lesser amount of butter. If it begins to separate as you are adding in the butter, it’s too hot. Remove it from the burner (which should be as low as possible) and whisk in some more butter off the heat until it comes together again. 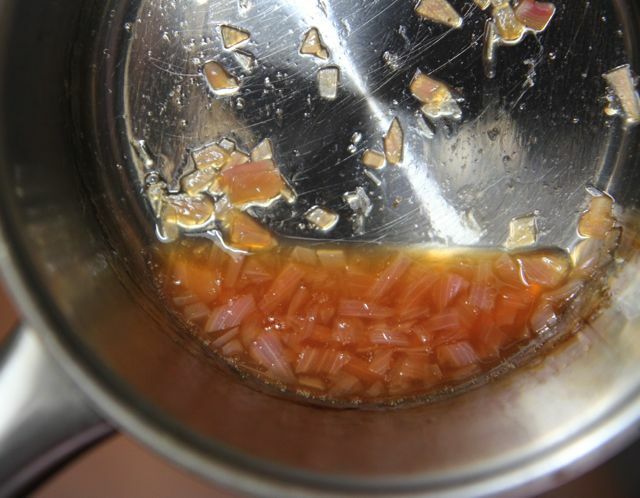 Leftover sauce can be kept in the refrigerator for up to one week and used as a flavored butter to saute vegetables! You can also use red wine to make “beurre rouge” but I ain’t tried it personally. Reduced to a thick liquid. A “thiquid”? Indeed. The finished consistency, shallot bits and all. This would be awesome on grilled flank steak. Nicely done, thanks for sharing, Hilah! Thanks, Morgan! Glad you found it useful. Thanks so much for posting these great sauces. I am so excited that you chose my question to answer as one of your posts. I actually made your Chick Fil Gay sandwich the other day and they were delectable! Thanks again! Thanks, Hilah. we love your stuff and humour . My partner is pretty fussy but it’s been smooth sailing since we found you. he even took photo’s of the plate to show you he loved it! he has Aspergers syndrome so it was a big deal introducing new things to the diets. thanks for everything! Good stuff. Oh, the chimichurri… 🙂 Thanks for sharing, Hilah dudette! I love that stuff! Thanks for writing, Ricardo my man! I am so looking forward to trying this! 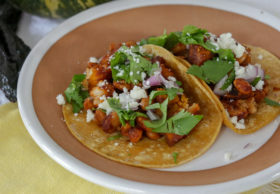 I have been trying to come up with various ways to cook chicken breast, tilapia filets, or ground turkey… you have provided some great sounding sauces to try with them! Thank you. Aloha, Rika! I’m very happy you found me! Thank you for your kind words – you’ve made my day. 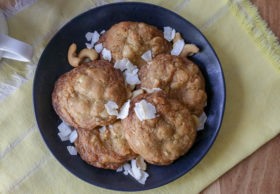 I hope you find some recipes on my site that your toddler will eat. 🙂 Have fun cooking! i cook for my shrimp,over low to medium heat add,4tbs olilve oil,1teas dill,1teasroasted garlic 1/4 ginger,1/4 rose mary leaves.cook until boiling point add shrimp cook for 5 mins..i add more olive oil,this way there will be sauce left over to pour over shimp.if frozen shrimp cook longer. Sounds delicious, Luka! I love the ginger and rosemary idea. My good friend served me an Angus steak the other day with Lobster Zoo (zu?) sauce with two types of mushrooms the other day and now I am into learning to make sauces. Thanks for sauces 101! Delicious sauces. I need to try these at home. Nice sharing. Thank you, thank you. For 40 years I’ve tried to figure out sauces. I’m not a great cook, but I do realize sauces can make the dish. Now I have practical information I can use daily. ! Great post ! That’s great, Mary! 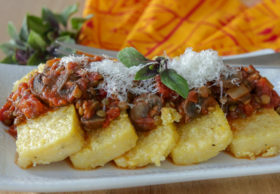 Enjoy these sauce ideas! 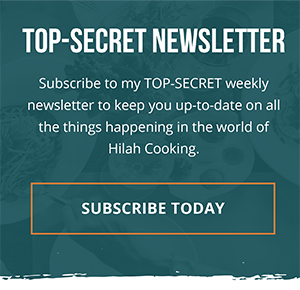 Thank you Hilah for your list of recipes. 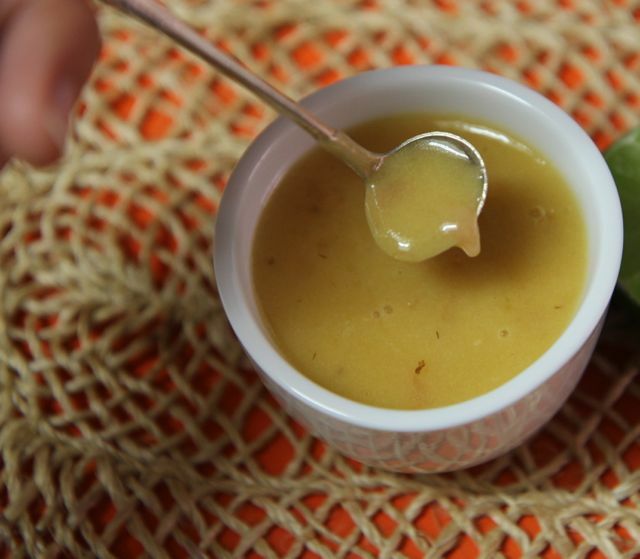 Adding homemade sauce to your meal is great, but everyone’s tolerance for spice is different. Make sure you start off mild and then gradually increase the heat until you find your sort of spice level.